Bristol Transport Strategy Consultation / Launch Event 26/09/2018. Great Western Coffee Shop > Journey by Journey > Bristol (WECA) Commuters > Bristol Transport Strategy Consultation / Launch Event 26/09/2018. To be held at Bristol city hall (the council house !) this coming Wednesday at 18:00hrs that's 6pm in the evening . And I'm sorry for the short notice only just found it myself. Looks interesting I'm going along to have a nose about. Re: Bristol Transport Strategy Consultation / Launch Event 26/09/2018. What a pity that it's just for that evening. I would have liked to have had a look at that but will be in the Peak District then. Surely just a bit more time for people to attend would not be unreasonable? Yes, we have only just added it to the forum calendar ... any member can add and please do! Along with the start date of the works to reopen the line to PortZ. We all need to get from A to B. Transport plays a big part in our daily lives. The draft Bristol Transport Strategy sets out our vision and ambition for transport in the city up to 2036. We will be launching the consultation on the draft strategy on Wednesday 26th September at 6pm in City Hall, College Green, Bristol. We would like to share the draft content of the Bristol Transport Strategy by inviting you, our citizens and stakeholders, along to the consultation launch and for you to take part in discussions with officers, Council Members and stakeholders who have been involved in writing the Strategy. We want to hear your views on the issues you face when travelling around Bristol and your ideas to help us tackle congestion and improve accessibility for all our citizens and visitors. We want to hear if you think the draft Bristol Transport Strategy covers these issues and sets out solutions to help us all move around Bristol efficiently, safely and reliably. Refreshments will be available from 5.30pm and the event will finish at 7.30pm. I'll try to attend and I presume DR, well known to Grahame will too, I'll try and contact him in the meantime. I shall be confined to Devon that day, with a raft of appointments of a potentially painful type, so shan't be able to get there. I hope it isn't just more of the highly successful MetroBust. Or, for that matter, consultation of the "Here's what we are going to do, please tell us why you agree with it" ilk. Hope that day goes well for you. You'll be welcome to join us in spirit in Bristol, and I expect we'll report back. Are going to the launch tomorrow of something that's already been launched? Good to catch up with a handful of members - and some other contacts too - ask night. Bristol has a transport problem. And the first step to sorting something out is admitting that you have a problem that needs sorting out in the first place ... and I think that admission and ethos was there. I left Bath bus station on an x39 bus for Bristol at 16:17. I got off that bus at the bottom of the slope at Temple Meads just after 17:50 ... panicking a bit about being late for the 18:00 meeting in the Committee Room at Bristol City Council. I need not have panicked because the meeting didn't get underway until 18:15. My understanding of the "x" in x39 is that it stands for "express" ... but it was far from that as we took 20 minutes to even escape from Bath past the Park and Ride (had I taken the train I would already have been in Bristol), we queued into and through Saltford and through Brislington, and we crept in all the way from the junction before the Arnos Vale Cemetery to Temple Meads. An astonishing display of what I can only describe as "road range" from our bus driver at the car in front which prevented him getting into a bus lane at one point - everyone was getting pretty fed up. Yet not a unique experience (?) as one of the pages in the consultation refers to an average traffic (or is that bus) speed of 6 m.p.h. The presentations were short - "we want your views" at the consultation launch. Personally I would have appreciated more background, but that may be an admission that I should have read up ahead of time. A couple of quarter hour table discussions, a ten minute coffee break in the middle, around 10 tables each talking for a couple of minutes as to what they had come up with ... add those up and you see how little the organisers said - we finished on schedule by 19:30. I did note in the council talk that "we are the only major city that does not have a mass transit system" ... and indeed a "mass transit system" may be a solution - but it struck me that there was a build desire more to have the system than to solve issues. That may just be how the speaker came across though ... and I did wonder how Metorbus fits in to the "Mass Transit System" category - presumably it's not regarded as such, through I think (acoustics bad for me in that room) there was thought of expanding it. The document on which they are consulting includes a map showing schemes in Bristol - and bus routes and corridors including the Metrobus. Yet on rail it shows the stations and not the routes. And little or no talk about rail during the 'evening'. It's as if rail is regarded as a way of getting in and out of Bristol and is discounted by the City Council as helping you get around the city. 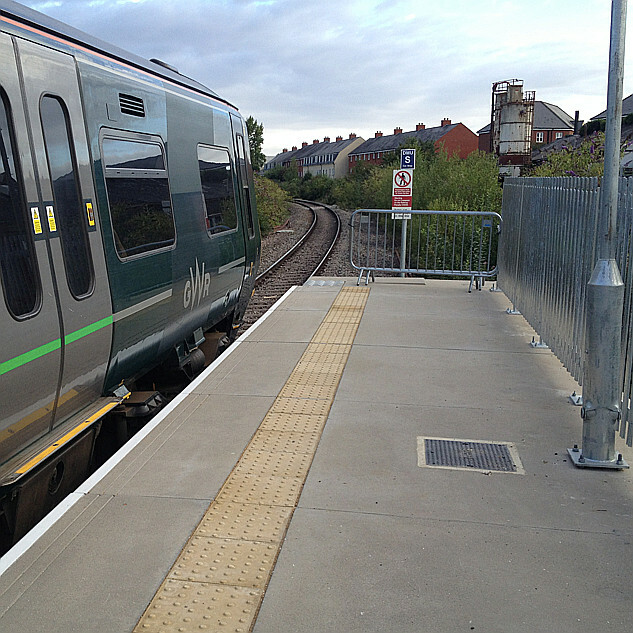 Sad, and astonishing - firstly rail could deliver people coming in from locations away from Bristol far more accurately to where they want to be in Bristol and indeed in the urban sprawl beyond Bristol itself. And second, it could provide that fast transit between points in Bristol using rail routes to existing stations, stations on lines that are open but trains whizz though, and indeed on some limited re-openings with a generous station provision. ... big cheer at the suggestion of bus franchising! The other theme that came out in addition to the carrot of efficient working public transport was the stick of hit the private motorist. More bus and cycle lanes to squeeze motorists further, more parking restrictions with a policy to remove any free parking, congestion zones, residents parking areas (residents paying for a permit), deliveries having to be scheduled - banned at busy times. I have a certain disquiet about much of this - I would far rather that the carrots be big ones and the sticks be little twigs. Was good to meet up with you again last night Grahame. I handed each of my tables acquaintances a copy of the Coffee Shop leaflet and all were impressed with some highlighting on or two of the topics. Bristol has a transport problem. Your dead right there Grahame, and the city has had the problem as far back as I can remember and that is over 60 years. I first became aware of the traffic problems of Bristol when I was a paperboy delivering the Evening Post and Evening World in the locality where I lived. Headline - Bristol Centre to be surrounded by toll booths. That was a plan to surround the central area with a series of toll booths through which motorists would pay a toll to enter the area and it became fodder for the waste paper basket. Headline - Bristol to get a monorail. That was a plan to encompass the central area with an overhead monorail and BCC chartered a Viscount aircraft from Cambrian Airways for Councillors and Top Officers to visit and see Munichs experimental monorail and that scheme again became fodder for the waste paper basket. Headline - Bristol to get a Light Rail Metro. A scheme put forward by the former HTV West news reporter Richard Cotterell, by then MEP for the Bristol area in association with a body, Avon Transit Authority (ATA). Killed off by one Dawn Primarolo then a councillor on BCC and others. Headline - Bristol to get a Metrobus Network. What we are getting, a network of 3 of what was originally 5, maybe its more, fast bus routes in Bristol to get people from where they live to where they work fast. The m3 route does it slowly, on the Ring Road and the M32 in the rush hours leaving passengers behind at the later stops on the inbound journey. The m2 route doesn't take the passengers where they work and want to get to, Anchor Road vicinity and gets caught up in the regular gridlock on Redcliffe Hill and Temple Meads areas. Headline - Bristol to get an underground. A pie in the sky idea by the current elected Mayor of Bristol to build an underground rail network under the city, pigs will probably fly before the first sod of earth is cut to begin the first tunnel bore. I blame Bristols traffic problems on the city's fathers, both past and present, for not taking decisive actions to rid the city of the traffic problems because they fear losing their seats at the next local election time and thus lose their nice pocket money earner, sorry councillors allowances, for, for some very little work but when it approaches re-election time they all seem to crawl out of the woodwork to boast of what they have done during their term of office representing their constituents. I blame Bristol traffic problems on the city's fathers, both past and present, for not taking decisive actions to rid the city of the traffic problems because they fear losing their seats at the next local election time and thus lose their nice pocket money earner, sorry councillors allowances, for, for some very little work but when it approaches re-election time they all seem to crawl out of the woodwork to boast of what they have done during their term of office representing their constituents. Maybe you're being a bit unfair to the 'city fathers'. They certainly took decisive action in the fifties, sixties and seventies, when vast swathes of the city were laid waste for major road schemes. We can all be eternally grateful that the worst of these were cancelled, and that much of the damage is now being undone. grahame - I agree that the attitude is very disappointing. 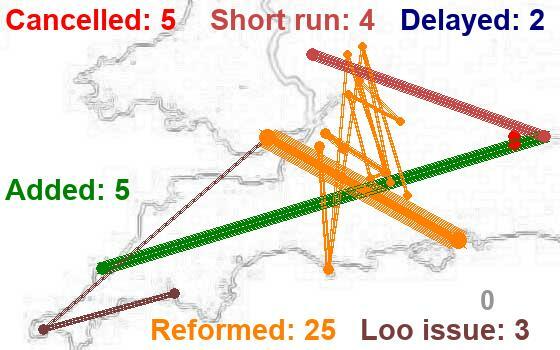 You will recall our work on the Gateway To The Future proposals back in 2007, where we modelled what a Greater Bristol Metro could look like based on the rail enhancement aspirations that existed at the time, and placed it in the expanded context of the wider regional rail enhancement aspirations that existed at the time, and modelled those as well. While there clearly has been some movement on - and some fulfilment of - some of those aspirations, it is striking how on others we are still hardly any further forward, and one can only guess how things would look today if only there had been more progress on those. I can give you such an example. From the early 1900's, the Chicago Tunnel Company ran an underground delivery service using, at its peak, around 150 small locomotives, 3300 miniature train cars, delivering 600,000 tons of freight a day, using basement connections to Chicago businesses. Business steadily declined until the company went bankrupt and the tunnels were sealed in 1959. However soon after, scrap metal thieves cleared out the tunnels, including the steel doors that were meant to seal off the passageways that ran under the Chicago River. This wasn't a problem until 1992, when a pile driver in the Chicago River hit a tunnel wall. A small crack became a 20-foot hole, and 100 million gallons of water flooded the tunnels. Many downtown buildings still had basement connections to the railway, so these buildings were flooded too, ruining stock in storage rooms. The Chicago Mercantile Exchange and Board of Trade were also forced to shut down, and electrical power was widely shorted out. The clean-up costs and estimated total damage came to more than $1 billion.